This particular New Orleans Cookbook has two of the finest Crescent City chefs in the business cooking up some serious gumbo together! 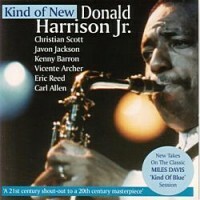 Donald Harrison Jr. and Dr. John got together with Donald's band for this culinary event up at New York's Birdland - one of many live albums recorded for Candid at the club, located at the time Uptown at 2745 Broadway and 105th Street. 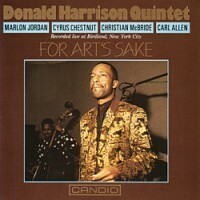 Donald is of course well known as one of the finest saxophonists of his generation-a long time member of Art Blakey's Jazz Messengers, co- leader of a fine band with trumpeter Terence Blanchard and young veteran of scores of albums under his own name-this being one of five on Candid. 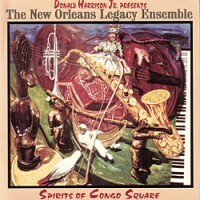 During his career he has been involved with many diverse aspects of the jazz idiom embracing the whole history of classic New Orleans music from second-line parade music of traditional jazz and the music of the Mardi Gras Indians tribe to the pioneering R&B of Professor Longhair and the contemporary funk of the Neville Brothers and Dr.John. Add to these ingredients his involvement with be-bop, post bop, nouveau swing and smooth jazz and one can understand why the Times-Picayune called him “A complex keeper of local culture “ ,“I travel through so many different styles of music, it's all part of me,” said Donald. As the son of Guardians of the Flame Big Chief Donald Harrison Sr., Harrison has made his way in the wider world of jazz beyond New Orleans much like the fictional character loosely based on him - Delmond Lambreaux in the hit U.S. Television series Tremé. Malcolm John “Mac” Rebennack a.k.a. Dr. John the Night Tripper found early inspiration from being exposed to records of jazz stars of the day along with hearing piano playing and minstrel tunes sung by his family. In his early teens he went to hear Professor Longhair who made a tremendous impression on the lad. He took up music lessons, concentrated on the guitar and started gigging around with local bands. He worked extensively as a session musician and all the time his style continued to evolve until eventually it incorporated as well as vocals, blues, jazz, pop, zydeco, boogie R&B and Funk. His profile increased with the success of his recordings and in the late sixties he gained a cult following with his album Gris Gris. And so it goes on - he has made scores of albums and had innumerable hits. He now has six Grammys to his name and in 2011 he was inducted into the Rock and Roll Hall of Fame and two years later was the recipient of an honorary Doctorate of Fine Arts from Tulane University. 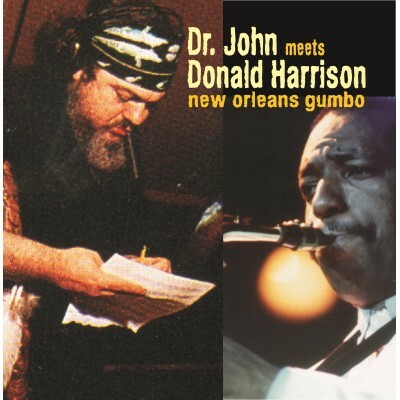 Dr. John was certainly in the Right Place at the Right Time in 1991 though when he appeared in this collaboration with Donald Harrison and his fine band. Cousin Joe's 1946 classic You Ain't So Such A Much gets this late night Birdland session into a down home groove right away propelled by Harrisons boppish alto. 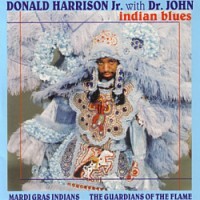 Likewise Donald soars through Ja-Ki-Mo a New Orleans standard sometimes known as Iko Iko. Shave 'em Dry is referred to as a “wild and woolly song” which Mac learned from Big Chief Jolly-this version enlivened by some choice lyrics from Roosevelt Sykes' Mother Fuyer. One of Professor Longhair’s best known songs is Big Chief, expertly worked over here by both leaders. Howard “Smiley” Ricks the noted percussionist featured on Mamzelle Zizi was brought up on the famous New Orleans second line rhythm. Dr. John tells it like it is on Livin' on Borrowed Time, which is a slow and soulful expression of the eternal problem which besets all over-spenders. Stephen Scott and the aforementioned Smiley get their chance for an extended blow on Hu-Ta-Nay before we all go Walkin Home. And the two true sons of America’s most unique city have upheld its tradition once again with joyous flair and pride.